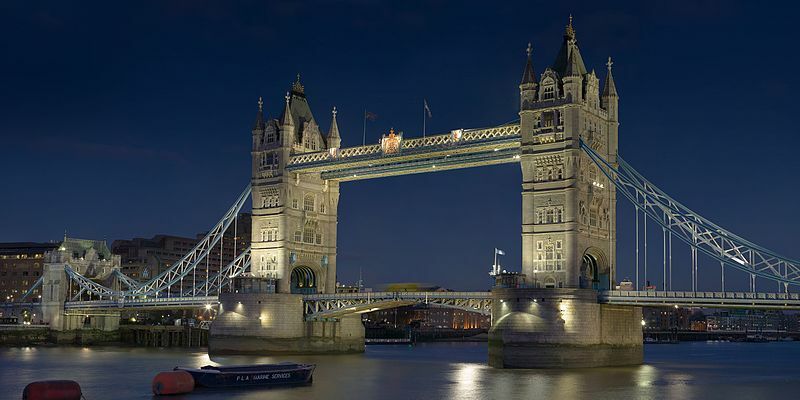 Visit one of the most famous bridges in the world when in London. The Tower Bridge is an iconic structure that makes its way to the list of top tourist attractions in the city. Here are some interesting facts about it. Not to be confused with the London Bridge, the Tower Bridge is a Victorian Gothic style suspension bridge and combined bascule that was built between the years of 1886 and 1894, 123 years ago. Construction of the 265 meter long bridge incorporated the use of 11,000 tons of steel and about 450 workers. At first, people didn’t like the whole Victorian Gothic theme, but later on when the bridge became one of London’s most iconic symbols, it sort of grew on them. The Tower Bridge is built over the River Thames; hence it was necessary for it to be built as a moveable bridge which can be opened to accommodate boat traffic. The special apparatus to open the bridge is concealed in the two towers. At first the mechanism was powered by steam to pump water into hydraulic accumulators which in turn powered the engines. However, after 1976 the entire mechanism became electrified. While taking photos of the bridge is a popular tourist activity, what’s even more fun is to go inside and see the amazing views of London from the point of the walkway between the two towers. The bridge is within easy reach of many a luxury Mayfair hotel the likes of COMO Metropolitan London as well as shopping destinations such as Piccadilly. Within the bridge you will find the Tower Bridge Exhibition which gives an excellent insight to the history of this iconic structure. The museum is found between the walkway and the two famous towers where you can watch the Victorian engine room.